Gregory Carter owns and operates Applied Engineering Software Group (AESGI) in Green Bay, WI. The firm manages storage, network and server operations for third-party contractors for a variety of companies, primarily in the Internet service provider (ISP), telecommunications and logistics and supply industries. Secondarily, AESGI deals with enterprise operations, analytic measurement and problem resolution in the same areas. A lot of Carter’s time is spent tracking down problems and redesigning issues of data center operations or cloud computing operations that are not working optimally. Carter was initially attracted to the Eurocom Panther 5SE because of its ability to handle a server class Intel Xeon processor. AESGI is sometimes running anywhere from 50 to 100 virtual machines, and requires the ability to model complex network problems. 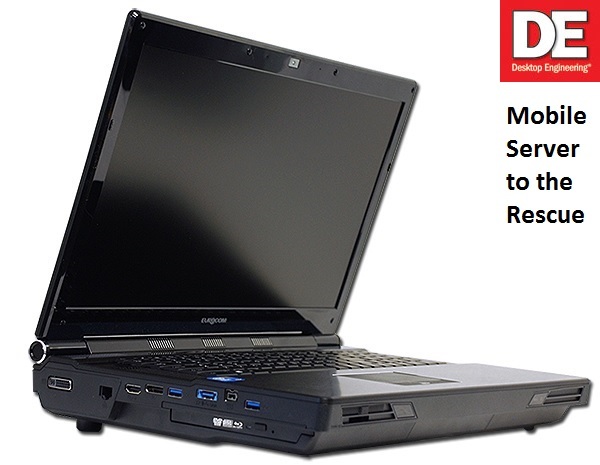 The Eurocom Panther 5SE Mobile Server is an all-in-one system that results in a 12-lb., 16.76 x 11.44 x 2.31-in. mobile server solution. Eurocom Mobile Servers support a variety of server class operating systems such as Windows 2012, 2008 R2, VMware ESXi, Enterprise Server Edition 6.4 and Linux. The Panther 5SE allows for network virtualization, multi-tenancy and storage resource pooling. Before the Panther 5SE Mobile Server, Carter used to haul around a desktop class system in excess of 80 lbs. to and from customer sites. The problems didn’t end there, though — sometimes simply plugging in the desktop machine would pull 600 watts and trip an uninterruptible power supply (UPS). Carter uses the Panther 5SE as his primary machine. He works on software development using Eclipse to write Android/mobile software. He also does audits on the configuration and builds of some of the YUM automation repos he has for many of his LINUX / HPUX / Solaris / BSD / Windows physical / virtual machines. The configured build of his Panther 5SE uses an AMD display card and “runs the KDE desktop very nicely,” he says. “I also use it for email/Web browsing — nothing like using a server-class machine to get your weather and email! The bonus of course, Carter concludes, is that all the gear was reduced in weight to about 15 lbs. Hefty for sure for a laptop, but not quite 80 lbs. Furthermore, it can fit on my lap in a pinch.